Find the perfect way to say "thank you" to the friends and family members who have always supported you. This gift should be symbolic of your relationships between you and your bridesmaid. If you choose identical gifts for your girls, add a personal touch with monograms. Making it a surprise is so much more fun! Not only are plane tickets expensive, but travel can also take up a significant amount of time. Think about gifts that may ease the travel process for your bridesmaids. Play it safe by giving them something compact, durable, and TSA approved! Your flower girs most likely think the world of you and your bridesmaids. Engage them in the day by treating them with a kid-friendly gift. If your wedding is in a cool climate, think about possible gifts to keep them warm — especially between taking wedding party pictures. If you and your bridesmaids will be spending a significant amount of time in heels, provide each of your bridesmaids with a cute pair of flats for dancing. If you want everyone to be manicured and red carpet-ready, surprise them by covering the beauty-related costs yourself. Splurge on a makeup team for the wedding morning, or arrange a girls' day at the salon for manicures a few days before. If your bridesmaids’ ages range considerably, keep this in mind when picking out gifts (maybe skip the monogrammed flask for your underage sister!). Varying generations may have different perceptions of the gifts. If you have a more lighthearted friendship, it can be tempting to give your bridesmaid a silly gift that'll make her laugh — but we'd recommend reserving any gag gifts for the bachelorette party and giving something more sentimental for the wedding. Sometimes it's the gifts that cost nothing at all that can be the most meaningful. Write each of your bridesmaids a personal note to thank her for her friendship and support through the years. Focus on quality rather than quantity. 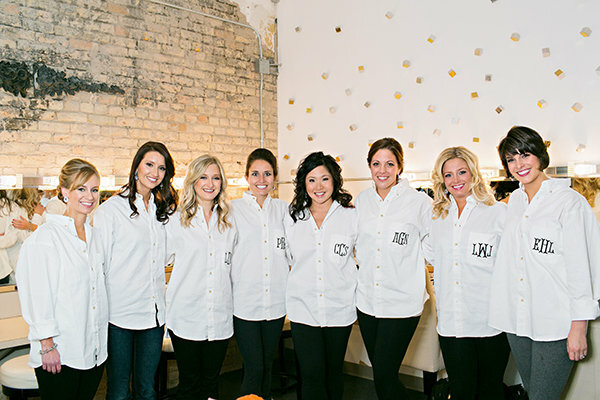 Bridesmaids are some of the most valued people in your life; your gift should reflect this. Planning a wedding is extremely stressful; treat yourself to a gift as well! Matching gifts, like robes, can provide fun group photo opportunities. If some of your bridesmaids have been in enough weddings to rival 27 Dresses, do a little digging and see if you can find out what they've received from other weddings. You don't want to give her yet another monogrammed clutch. Have you been a bridesmaid in the past? What did you like or dislike about your experience? Is there anything you wished the bride provided? Choose a gift that'll make their lives a little easier. You don't want to be shopping for your bridesmaids' gifts the week of your wedding; the stress isn’t worth it. This can be a way to develop camaraderie among the groups. For example, if the bridesmaids receive earrings, the groomsmen may receive cufflinks. Or select tote bags for your bridesmaids and duffle bags for the groomsmen. While you can certainly give him some suggestions, only he can decided on the most appropriate gifts for his nearest and dearest. Avoid uncomfortable situations by making sure your gifts do not conflict with any of your bridesmaids' beliefs, personal struggles, or health concerns. Include it on the thank-you card instead. This your big day, not theirs, so the date will carry lesser significance to them (parents are a different story, though!). The wedding day would not exist without them. Additionally, they most likely will be heavily involved with your day, perhaps to an even greater degree than your bridesmaids. A higher quality piece of jewelry or an engraved picture frame to fill with a family shot from the wedding make perfect gifts for moms. Go DIY! Consider making this pyramid wristlet purse, embroidering an old fashioned linen handkerchief, or sprucing up some bland hair accessories. Whether you opt for an electronic copy or prints, photographs are always keepsakes. Give each of your bridesmaids a personalized frame to hold your favorite photo together. Save the over-the-top-gifting for her birthday. You'll drive yourself crazy if you try to hunt down the "perfect" gift for each bridesmaid — and likely blow your budget. Give yourself a reasonable price cap before you start searching. After the wedding, it sometimes becomes "work" to keep up your relationships with your best girlfriends. Give the gift of time together — a spa gift certificate for a girls' day or tickets for a play or concert to attend together. Time to share with those you love is a gift in and of itself.